If you are looking for "real" PMP exam questions that have appeared on actual (official) PMP exams in the past, then this post will provide you a definitive answer. You can find "real" PMP exam questions only on the "real" PMP exam and no where else. All questions that appear on the PMP exam are PMI's intellectual property and PMI does not publish nor permit any one to publish these questions in public domain. It is strictly illegal to publish such questions on any website. If you find any site claiming to provide "real" PMP exam it is likely to be a scam site and should be reported to PMI immediately. However, I have good news for you. If you are looking for "realistic" PMP exam-like questions, you can find over 1000 such questions on BrainBOK PMP Exam Simulator. 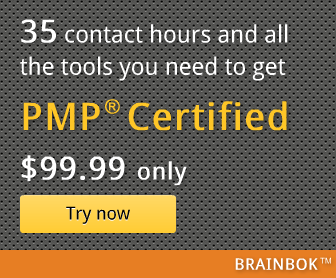 BrainBOK sample questions are developed and reviewed by certified-PMP professionals. The exams are slightly more difficult than the "real" PMP exam. People who score 50-55% or more on BrainBOK PMP exams in their first attempt usually go on to pass the "real" exam.